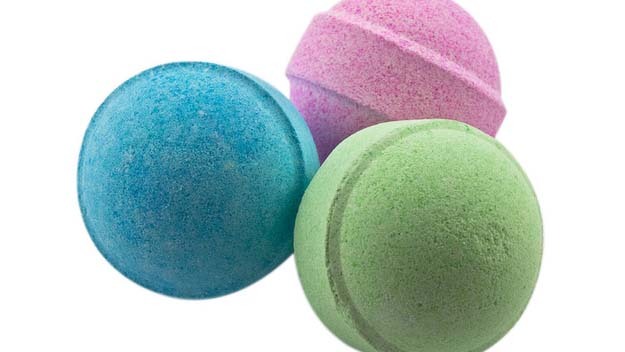 To make a bath bomb you need to start with a base mixture to which you add different colours and fragrances to create individual bombs. Before you start, make sure that all your equipment is dry, because any drop of moisture will start the mixture fizzing. Make the base mixture by sieving together 1 1/2 cups of bicarb soda and 1/2 cup of citric acid into the large mixing bowl. Stir well with a spoon until thoroughly mixed. This is enough to make four bath bombs. Any left over mixture can be stored in an air tight container ready for later use. Transfer 1/2 cup of base mixture into the medium size bowl and set aside. Using the small bowl: For an orange bath bomb: Mix together 6 drops of orange essential oil, 1/2 teaspoon of sweet almond oil, 5 drops of red food colouring and 7 drops of yellow food colouring. Mix well using the teaspoon. For a lemon bath bomb: Mix together 7 drops of lemon essential oil, 1/2 teaspoon of sweet almond oil and 15 drops of yellow food colouring. Mix well using the teaspoon. For a lime bath bomb: Mix together 6 drops of lime essential oil, 1/2 teaspoon of sweet almond oil and 15 drops of green food colouring. Mix well using the teaspoon. Pour the oil mixture of your choice into the medium bowl containing the 1/2 cup of base mixture. Stir very quickly so that the mixture doesnt start to fizz. Continue mixing with your fingertips, working the oil mixture into the base mixture until it starts to come together and stays compressed when squeezed (about 30 seconds). Wipe some sweet almond oil around the inside of the mould. This will make sure the bath bomb will slip out easily from the mould. Now press the mixture into the mould. Fill the mould 1/3 at a time with the mixture, pressing down firmly as you go. When you reach the top of the mould, neaten the edges, turn the mould over, bang firmly on a flat surface and the bath bomb will slip out. Step 9Let it set for 24 hours. It is then ready to use!